On January 20, 1692, three preteen girls were brought to trial in colonial Salem, Massachusetts, accused of being witches. These charges were based on their blasphemous outcries, convulsive seizures, and trance-like states, which the local physician diagnosed as signs of bewitchment. These children were convicted; two were hanged and one spared the noose by dying in prison. By the end of the year, twenty individuals were accused and executed as witches. Witch trials were not unique to Salem, and it has been reported that, from 1450 to 1750, some 40,000 to 60,000 people were tried and condemned to death as witches in Europe; the last reported European witch burning occurred in Poland in 1793. During this period, in Europe and North America, supernatural influences pervaded all aspects of life and were blamed for illness and misfortune. Many scholars have attributed the symptoms exhibited by the three girls, and many of those accused, to ergotism, a disease of rye and other cereals caused by the fungus Claviceps purpurea. The ergot kernel, the sclerotium, develops when spores of Claviceps infect cereal plants. This fungal infection resembles pollen grain growing into an ovary during plant fertilization. During the cool and damp periods in early spring, the rye and grain-like ergot are harvested and milled together; rye was a staple crop of the poor. Ergot poisoning occurs in humans and other mammals, in particular, grazing cattle. Ergotism was common in France, where the climatic conditions were propitious for the growth of ergot; it caused the death of 40,000 in southern France in 944. The primary symptoms are convulsions and gangrenous ergotism, in which constriction of blood flow to the extremities can cause extreme burning pain, gangrene, and the loss of the extremities. In 1670, a French doctor named Thuillier determined that ergotism was not an infectious disease but rather resulted from the consumption of ergot-contaminated rye. The life cycle of ergot was established by the French mycologist Louis Tulasne in 1853. Alkaloids extracted from ergot have been used medically to treat migraine headaches and to induce uterine contractions and to control bleeding after childbirth. SEE ALSO: Fungi (c. 1.4 Billion BCE), Plant-Derived Medicines (c. 60,000 BCE), Agriculture (c. 10,000 BCE). 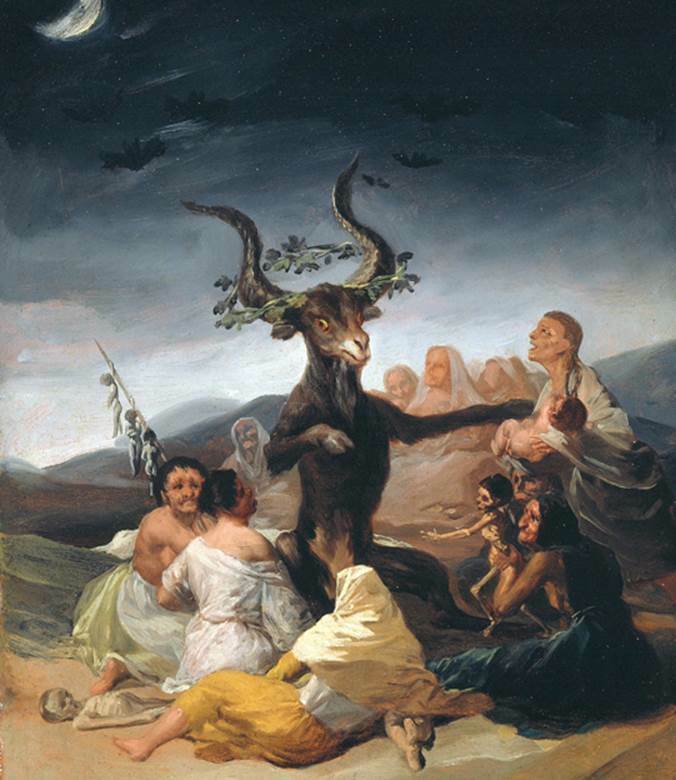 The painting Witches Sabbath (1798) by Spanish artist Francisco Goya (1746–1828) represents the devil as a goat.